We offer a wide variety of portable trade show monitor and TV stands to fit your exhibit needs. These monitor stands for trade shows are available in varying heights, sizes and styles, and can display monitors as large as 71". Choose which stand will best display your monitor from the many styles we offer: wheeled monitor carts, portable monitor stands, touch screen monitor stands, and dual monitor stands. A portable trade show monitor stand can safely mount your TV or monitor, and give your exhibit a professional look. 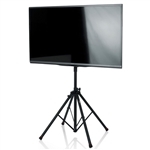 Standard Trade Show Quadpod LCD/LED TV Stand; up to 65"